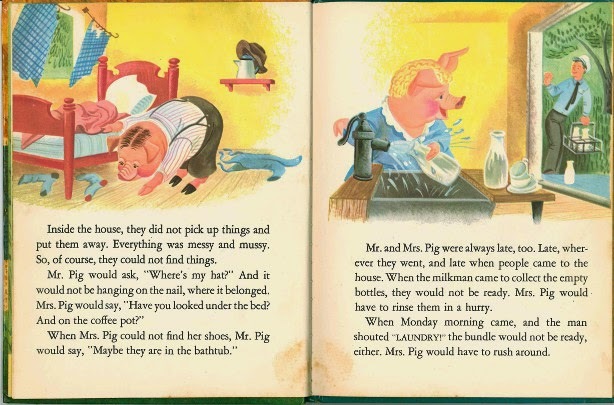 A cautionary tale about order and responsibility featuring pigs. Mr. and Mrs. 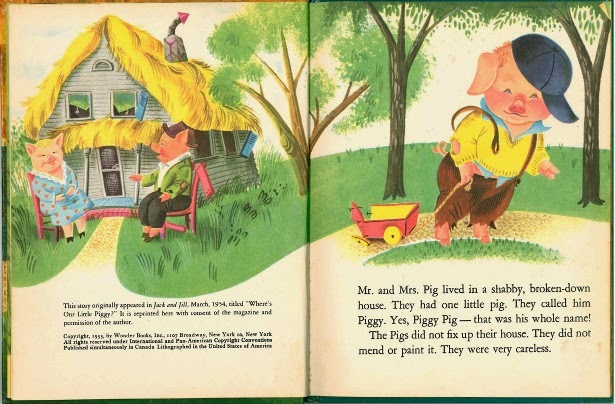 Pig lived in a shabby, broken-down house. They had one little pig. They called him Piggy. 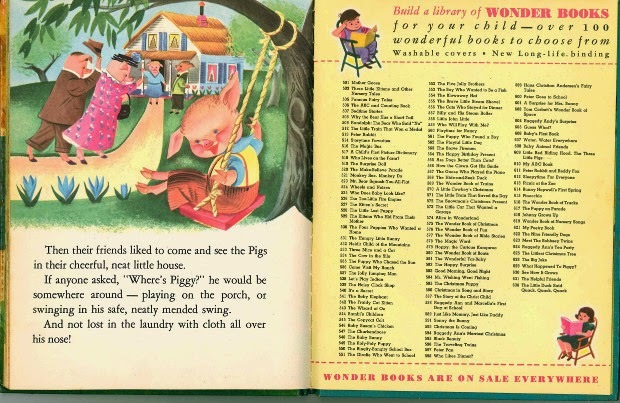 Yes, Piggy-Pig--that was his whole name! 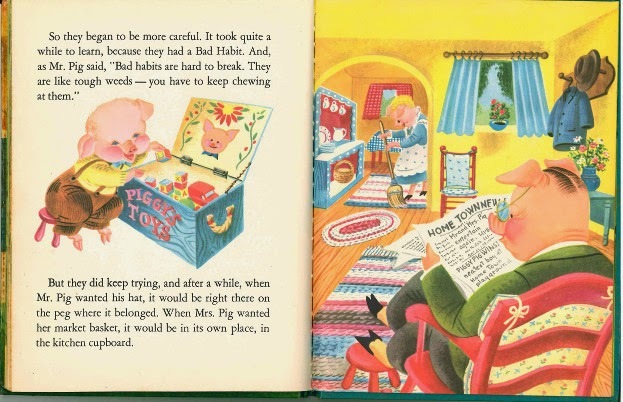 The Pigs did not fix up their house. They did not mend or paint it. They were very careless. Inside the house, they did not pick up things and put them away. Everything was messy and mussy. So, of course, they could not find things. Mr. Pig would ask, "Where's my hat?" And it would not be hanging on the nail, where it belonged. Mrs. Pig would say, "Have you looked under the bed? And on the coffee pot?" When Mrs. Pig could not find her shoes, Mr. Pig would say, "Maybe they are in the bathtub." Mr. and Mrs. Pig were always late, too. Late, wherever they went, and late when people came to the house. When the milkman came to collect the empty bottles, they would not be ready. Mrs. Pig would have to rinse them in a hurry. When Monday morning came, and the man shouted, "LAUNDRY" the bundle would not be ready, either. Mrs. Pig would have to rush around. Sometimes Mr. and Mrs. Pig even had to ask, "Where's Piggy?" Once he had got carried away in the vegetable man's cart, in a basket of onions, before they noticed. They had to chase him way down the road. Mr. and Mrs. Pig were always late too. Late, wherever they went, and late when people came to the house. When the milkman came to collect the empty bottles, they would not be ready. Mrs. Pig would have to rinse them in a hurry. When Monday morning came, and the man shouted "LAUNDRY" the bundle would not be ready, either. Mrs. Pig would have to rush around. Sometimes Mr. and Mrs. Pig even had to ask, "Where's Piggy?" Once he had got carried away in the vegetable man's cart, in a basket of onions, before they noticed. They had to chase him way down the road. He was a cute little pig, and would have been nice, if he had been nicely taken care of. But he had never been taught to to wash his own face or pick up his toys. His swing in the garden was broken-down too, just like the house. When friends came to see the Pigs they did not care to stay long. For when they tried to walk across the floor they would trip over books and toys. When they found chairs they would sit down on clothes and dishes and nuts. So they wold say, very soon, "Well, we must be going." and they were glad enough to get away too! One Monday morning Mrs. Pig heard footsteps on the porch. "LAUNDRY" shouted the man. "IN A MINUTE!" she shouted back. She snatched the soiled towels from the bathroom floor. Then, in a big hurry, she pulled the sheets off the beds. She stuffed them into the laundry bag, and gave it to the man. When he had gone Mr. 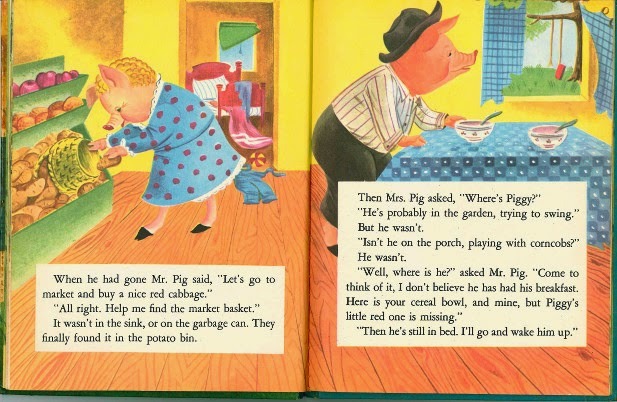 Pig said, "Let's go to market and buy a nice red cabbage. "All right. Help me find the market basket." It wasn't in the sink, or on the garbage can. They finally found it in the potato bin. Then Mrs. Pig asked, "Where's Piggy?' "He's probablly in the garden, trying to swing," But he wasn't. "Isn't he on the porch, playing with corncobs?" He wasn't. "Well, where is he?" asked Mr. Pig. "Come to think of it, I don't believe he has had his breakfast. Here is your cereal bowl, and mine, but Piggy's little red one is missing." "then he's still in bed. I'll go and wake him up." Mrs. 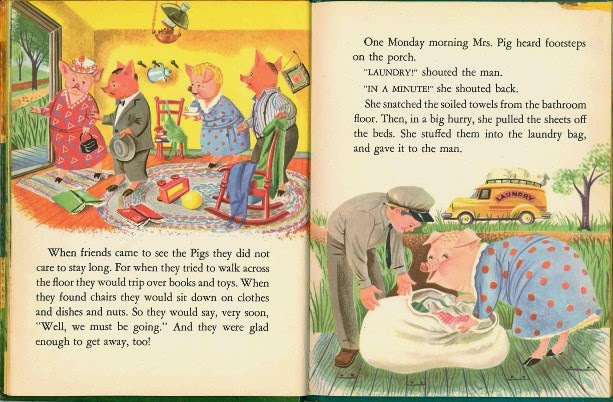 Pig came back from Piggy's bedroom. She looked frightened, and very pale pink. She said, "He's not there!" "What? Isn't he sleeping cozily under his own blanket?" "No. The blanket is there, but that's all. So I must have bundled Piggy up with the sheets and sent him to the laundry!" Mr. Pig looked alarmed. "Well," he said, "we had better rush to the laundry, quick, before they send him down the chute into a tub of hot water!" They ran down the road to the village. The man in the laundry office was very suprised when they came rushing in. "We want our sheets back, quick! Our child Piggy is in them!" "I'm afraid it's too late," said theman. "They have already gone down the chute." Mr. and Mrs. Pig jumped right into the chute themselves. It was dark and slippery in there. They slid along fast. Then they came whizzing out in the room below. "We want our sheets back! Our child Piggy is in them!" The pigs working there were astonished to see them. "But our bundle has already gone to the washing-room!" Mr. and Mrs. 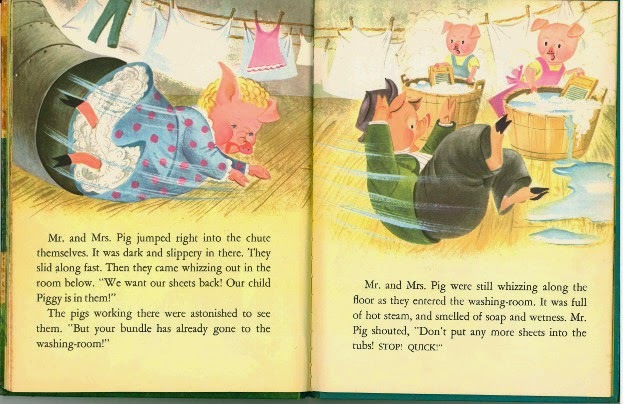 Pig were still whizzing around along the floor as they entered the washing-room. It was full of hot steam, and smelled of soap and wetness. Mr. Pig shouted, "Don't put any more sheets into the tubs! STOP! QUICK!" Just then there was a loud squeal from a bundle in the corner. Mr. and Mrs. Pig rushed over there. 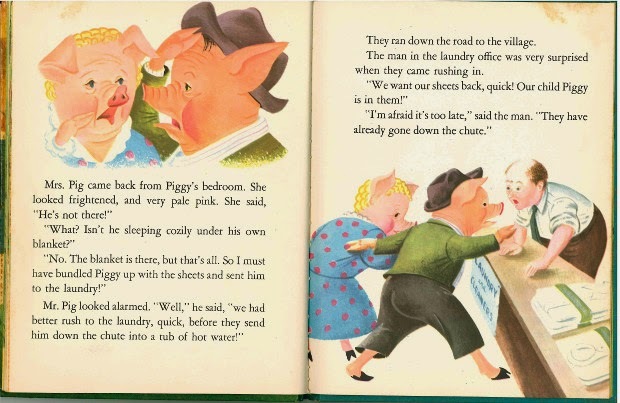 They shook the sheets--and Piggy tumbled out, "Where am I?" he asked. "Why was cloth all over my nose?" They hurried him home. They didn't stop to talk. Mrs. 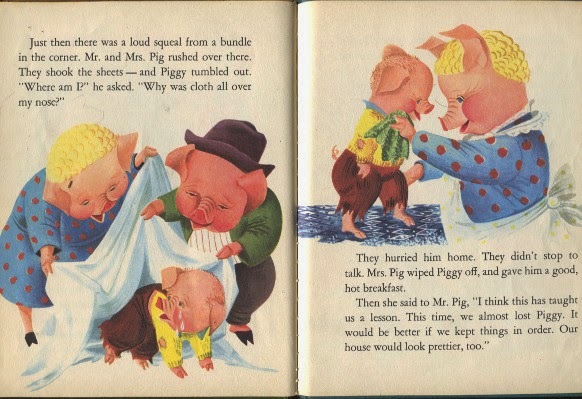 Pig wiped Piggy off, and gave him a good, hot breakfast. They she said to Mr. Pig, "I think this has taught us a lesson. This time, we almost lost Piggy. It would be better if we kept things in order. our house would look prettier too." So they began to be more careful. It took quite a while learn, because they had a Bad Habit. And, as Mr. Pig said, "Bad habits are hard to break. They are like tough weeds--you have to keep chewing at them." But they did keep trying, and after a while, when Mr. Pig wanted his hat, it would be right there on the peg where it belonged. When Mrs. Pig wanted her mrket basket, it would be in its own place, in the kitchen cupboard. 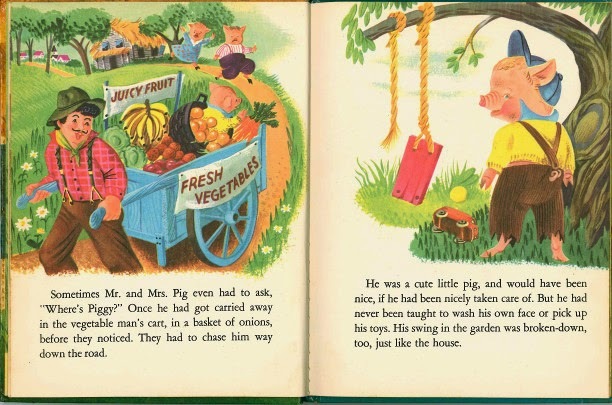 Then their friends liked to come and see the Pigs in their cheerful, neat little house. If anyone asked, "Where's Piggy?" he would be somewhere around--playing on the porch, or swinging in his safe, neatly mended swing. And ot lost in the laundry with cloth all over his nose! 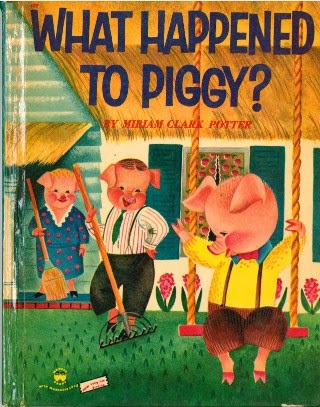 My mother read this to 'we ' four girls...growing up in the 1950's. I loved this so much, almost had it memorized. I had nearly forgotten about this, until I thought of the title today and researched it....was SO thrilled to find your site and re-live memories. I also looked on Amazon and found they were selling the book for at least $58 ! This is such a cute story book.Perfect for the toddlers.I am sure every mom will get hands on this book to entertain their toddlers. I read this book as a 6 or 7 year old. It had a huge influence on me. Wish I still had my copy. 60 years later, I can see why I get a deep sense of well being from bringing order out of chaos.